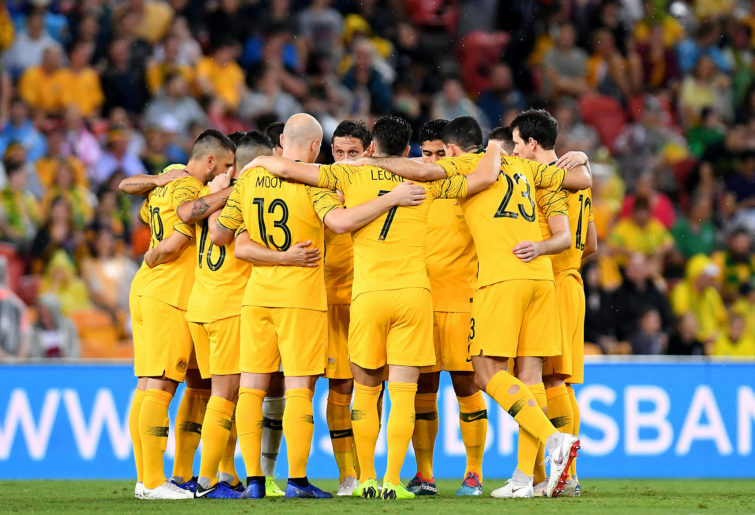 Against a rabble of a defence, rotating in and out a great number of players, Australia’s 5-0 friendly win over Oman did little more than maintain the slightly vague, not quite confident, not quite pessimistic impression of our Asian Cup chances. Another experimental starting XI saw Milligan pushed from centre back into the midfield alongside Mustafa Amini and fresh face Chris Ikonomidis. Robbie Kruse and Awer Mabil started as the wingers either side of Andrew Nabbout. Milos Degenek began as Trent Sainsbury’s central defensive partner – about time he was rewarded for his fine club form – and Rhyan Grant and Aziz Behich were the full backs. Mat Ryan, the most automatically assigned of all our starters, was placed steadily between the sticks. This match was played in an empty stadium, a rather eerie situation, almost as if the game was a figment of some Lynchian fever dream, perhaps to be interrupted at some point by a streaking Isabella Rossellini, before the scene is drained of all colour, descending into an expressionistic montage of H-bomb blasts and burning celluloid. Every one of Graham Arnold’s barked instructions was heard clearly on the telecast, echoing around the empty banks of plastic seats. Milligan’s more advanced position might be an indication of exactly how Arnold plans to cover for Aaron Mooy’s absence. All this talk of Jackson Irvine, the snubbed Terry Antonis; the answer for the question of a missing No.6 is probably the Australian captain, an accomplished, versatile and responsible 6, whose reassignment as a centre back has always been worth questioning, admittedly less so than a number of other issues. The attacking unit quickly settled into a front four, of sorts. Ikonomidis pushed up, and joined Kruse, Mabil and Nabbout. All four intermingled, taking up narrow positions, slipping out wide, but always leaving room for the full backs to offer alternative width. Milligan and Amini – and more so the captain – made sure to hold their position, and drop between the centre backs if they needed to split. Often Amini would slide out into a right full back position to offer a passing option to his centre backs. The first goal was a gift from an Omani defender, who literally chested the ball straight to Nabbout in the box, under no apparent pressure. Nabbout had simply to fake a shot, cut inside, and complete a simple finish. The second goal, which came in the 13th minute, capped a rollicking attack, fuelled largely by Amini’s run down the right – starting from that aforementioned auxiliary right full back’s position. He squared a neat pass inwards, running at full speed, for Mabil, who then lifted the ball over the backtracking defence for the very advanced Ikonomidis. The Glory attacker’s volleyed shot snapped in off the post, a fine finish indeed. The lead was 2-0, with Oman quickly revealing themselves as substandard opponents. One aspect of the system on show here – at least as comprised by this set of players – is a void of central passing options that developed in the midfield. If Amini was sliding out wide, or was simply outnumbered by markers, then often the centre backs had to pass side-to-side until another option appeared, or hit a lofted pass to a runner in behind. At Sydney, Arnie played two holding midfielders in Brillante and O’Neill, but this was compensated for by Milos Ninkovic and Adrian Mierzejewski tucking in and dropping into the central midfield, to collect the ball, turn, and make plays for teammates. For Australia there is no player with the skillsets of the last two Johnny Warren medallists; Kruse and Mabil are certainly not equivalent playmakers. So, instead of the two most widely placed attackers tucking in, all four of the Socceroos’ front unit players took turns dropping into the midfield, even Nabbout. Most of the time, if they were passed to, the pass would return immediately back to the defender. Other times saw no players drop, with all of the four attackers making mazing runs all at once, befuddling a clearly frail Omani defence. It was from this situation that Australia scored a third goal. Nabbout traced a diagonal run from the centre out to the left hand side of the attacking third. He ventured so far wide that he ran into Behich, making a run up the wing; one of those runs had attracted a clipped pass, but it was Behich who got to it first. His cross bounced all the way into the box, finding Mabil who tapped home. These flurries of activity were effectively flummoxing a terrible Omani back line here, but against a more organised team the absence of those central playmakers may become a problem. If the two midfielders are too conservative, and the runs ahead are confused – or indeed the passes up to them poorly hit – then we will need a midfielder who can advance our possession, who can turn and attract defensive attention, and who is good enough to play his way through pressure. Does this player exist? The Socceroos strolled through the first half, allowed by their Omani opponents to carry the ball unmolested past the halfway line. From there, they knocked it from wing to wing, occasionally trying some longer passes, some of which connected, some of which didn’t. The team was unchanged when it came out for the second half, and the demeanour of the match remained as intact. Oman were only a sporadic threat. Mabil smashed a free kick down the throat of the goal, forcing the Oman keeper to bat it over the bar. From the resulting corner, Milos Degenek curled in a wonderful shot, hooking a low, bouncing cross over his shoulder and inside the far post, a fully deliberate and highly inventive bit of finishing. 4-0 now, with an hour gone. Robbie Kruse was removed for Jamie Maclaren; of all the front four, Kruse had been the least central to Australia’s play. Mustafa Amini was substituted for Mass Luongo, who one presumes is a leading candidate for one of those two central midfield spots. Amini had been busy, largely clean in his passing, without being especially eye-catching. His positional work was good, and he seemed to respond attentively to every command he got from the sidelines. Luongo was immediately a tigerish presence, winning a free kick after a thirsty pursuit of the ball. Not long after that he got out of a tight situation, crunched up against the sideline, with a drop of the shoulder, ridding himself of a tackler before passing calmly back. Jackson Irvine and Martin Boyle came on, for Milligan and Nabbout respectively, with 15 minutes remaining. Boyle began with a swerving run on the right, making swift juts between defenders, something that’s always a welcome sight. Alex Gersbach and Matt Jurman were brought on; Arnold was really rolling through the rotations now, giving as much of the squad a bit of time with the turf between their studs. The latter portion of this match was drifting into listless doldrums, with the game won, the players easing off the throttle, and the lilting, rather beautiful call to prayer ringing out over the stadium PA.
Jackson Irvine hammered home a fifth goal, his first touch – probably unintentionally – popping up, begging to be hit on the volley, after a sharp pass from Gersbach. It was a nice bit of oomph to end a game that had, up until that point, lost all of its vitality. 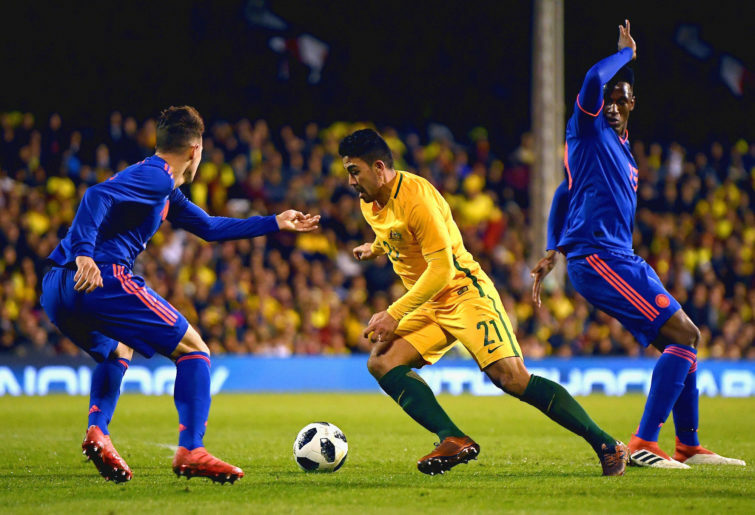 As against Lebanon, there was little tangible to take from this game; the opponents were awful, many of the goals were handed straight to the Socceroos on a platter, and the team selected was, in large part, a pre-tournament experiment. Milligan will be a fine Mooy replacement, and Degenek a fine Milligan replacement at centre back. Boyle and Luongo should start, probably for Kruse and Amini. Mabil should start too, especially if Matt Leckie – sitting in the stands here – is deemed unfit for the group games. Ikinomidis did nothing to hurt his chances either. But this result, emphatic on paper though it was, did not provide firm evidence for much of anything.